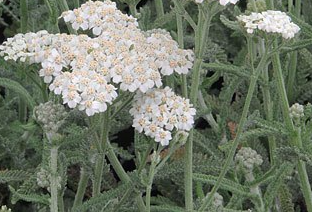 A fine form of our native Yarrow that has leaves that are a striking gray with pure, clean white flowers. A great combination. Spreads to form a low wide plant that is evergreen (gray). The flat clusters of flowers appear continuously from May to frost. More consistently if you remove spent flowers. The umbels, unusual for the daisy family, are loved by butterflies. Well, actually all pollinators. They are given a flat landing pad and tons of flowers- what more could you want. 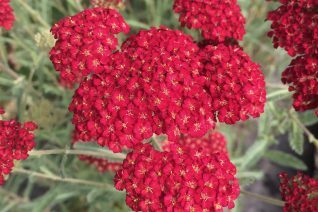 Excellent for low care areas where this romping perennial will happily out compete weeds and hold ground with very light amounts of water. Full sun and well drained soil. its best to double dig the soil to incorporate oxygen and de-compact the soil. Does not like compacted soil. Light but consistent summer water speeds growth and vigor. Otherwise very drought tolerant. Excellent on slopes. 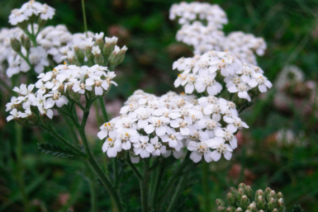 To 20″ tall in bloom on a low spreading foliage plant to 2′ wide or wider. High deer resistance. Great cut flower. Mix with other low water plants. 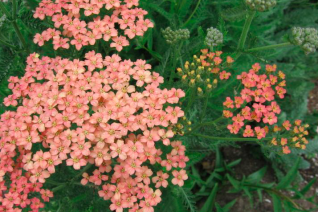 Pretty with other colors of yarrow. Oregon native plant.